Purple crocuses flowering at Thamesview Crematorium next Spring will be part of a world-wide battle against polio. 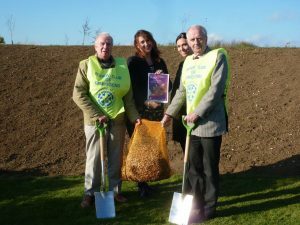 Gravesend Rotary presented 5,000 crocus corms to the new crematorium and cemetery at Gravesend as part of the Purple4Polio campaign to raise awareness and funds to eradicate the disease. Purple is the colour of the dye placed on the little finger of a child to show they have been vaccinated against polio, hence the name Purple4Polio. Senior Gardener Rob Taylor and his team now have the task of planting the corms in a carefully prepared bank near where families leave the chapel after the services. Here are 5000 crocuses to plant say Gravesend Rotarians to Kevin Wardle, Susan Wood and their team at Thamesview crematorium. Rotarians John Baker and Adrian Warburton hand over the corms to Susan Wood, crematorium supervisor. 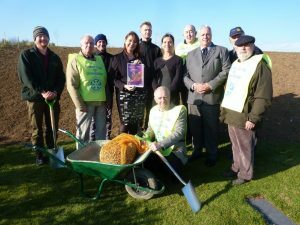 Gravesend Rotary Club is highlighting historic progress towards a polio-free world by providing these crocuses. Rotarians throughout Britain and Ireland are holding many Purple4Polio events to bring awareness of and raise money for the Rotary campaign to End Polio Now and forever. With millions of children to vaccinate, this makes it easier to see who has been protected and who has not. We helping to make history by joining millions of Rotarians and supporters across the globe raising awareness, funds and support to wipe polio off the face of the earth. Polio is a vaccine preventable disease that still threatens children in parts of the world today. The world has have never been closer to making history and fulfilling Rotary’s goal of a polio-free world with just 10 cases of wild poliovirus worldwide so far this year in Afghanistan and Pakistan. District governor Carol Vizard, who oversees clubs in Kent and Sussex, presented a commemorative 90th birthday certificate and Rotary clubs in. Bromley, Dover, and Northfleet also passed on their congratulations. Mr Spiller said: “Gravesend members represent all that the founders of Rotary had aimed for back in 1910 when the movement started. Â The Gravesend club can truly be said to be punching above its weight.” He praised its support of local food banks, helping school children and the elderly, and the provision of facilities at the ellenor hospice. The new club president for 2017/18, Tony Muckley, said he was honoured to take on the responsibility. 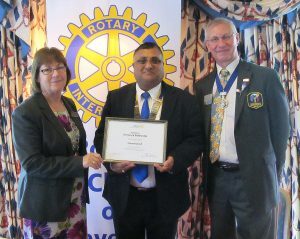 He said he was keen to attract more members during his time in charge, with anyone interested in helping out urged to visit www.gravesendrotary.org.uk. 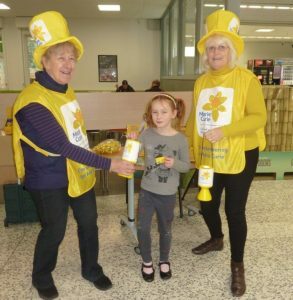 Every year the Rotary club of Gravesend helps local and national charities, including Marie Curie Cancer Care with their Daffodil Day collection. This year over £608 for the Marie Curie home nursing service was donated by the shoppers at Gravesend’s Asda supermarket. On Saturday, March 11th 2017 members of the Gravesend Phab club, which provides a social meeting place for people with a wide range of disabilities, joined with Rotarians at the store. The photo shows Phab secretary Eileen Perks(left) and Rita Hunter (right) with 7 year old Francesca Winder of Northfleet – click on it for a larger picture.